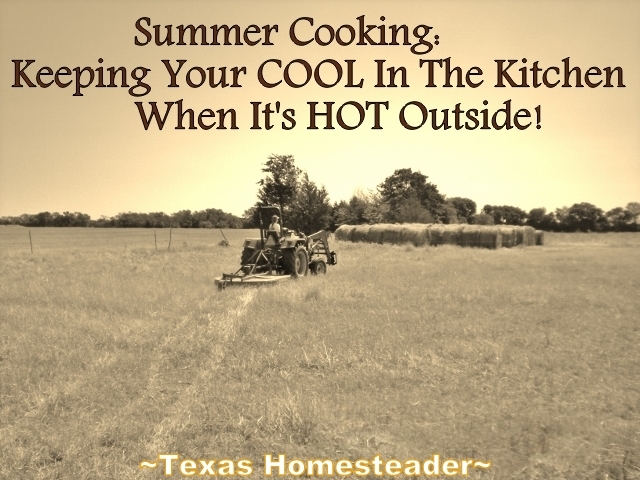 Summer Cooking – Keeping Your Cool In The Kitchen! Living in the hot and humid environment of Texas, keeping our home cool in the summertime is an expensive endeavor. The AC really really has to work overtime! In the heat of summer we often opt for cooler summertime menu options. But cooking still needs to be done. To keep the house more comfortable and to keep our utility bills low I’ve learned a few tricks to cooking without adding unnecessary strain to our AC system or our budget during the summer heat. First is my go-to method of cooking – cook-once-eat-twice. This simply means that if you’re going to fire up that oven for, say, meatloaf – go ahead and cook an oven full of them. You’ll enjoy your meatloaf for dinner that night. Then when the remaining meatloaves are cool simply section them off in meal-sized servings, label and freeze. That way when you’re in the mood for meatloaf again you don’t have to cook it. Just pull one of your meal-sized servings out of the freezer and place it in the refrigerator overnight to thaw. When it’s time for supper a quick heat in the microwave & a couple of added side dishes are all you need. Not only has a home-cooked supper arrived at the table in record time, but precious little additional heat has been added to your home. That’s a budget saver in two different ways! Another idea is to actually cook outside. I really love using my slow cooker to slowly cook my main dishes like Slow Cooker Spicy Sticky Chicken to savory perfection. Even though a slow cooker doesn’t put out as much heat as an oven, I still don’t want to add unnecessary heat inside when it’s so hot. 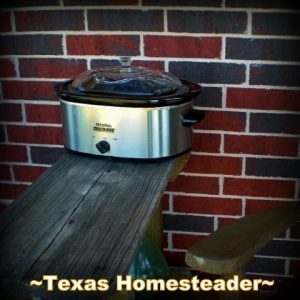 Easy fix: I fill my slow cooker with all the ingredients needed for my recipe and take it out to my back porch. I set it on my outside table and plug it in. Voila – no extra heat in the house! I also use this outside table when using my toaster oven for smaller dishes like individual chicken pot pies and when using my * Rotisserie Oven for grilled veggies, fish or of course rotisserie chicken. How about using free solar energy to cook? 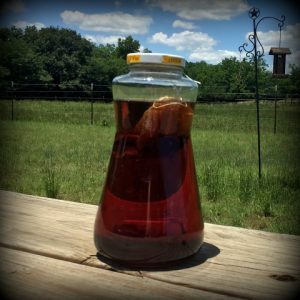 It’s easy to make sun tea with a teabag in a large jar with a lid. You don’t need to buy a special container for your sun tea. I use this large picante bottle. The hourglass shape makes it easier to securely carry. And it’s large enough to hold several cups of water. When the tea is brewed I bring it in and pour it into my tea pitcher. Then I top off the pitcher with water and I’m done. There was no purchased energy necessary. And no extra heat in the house either! You can also use the sun to dehydrate foods. 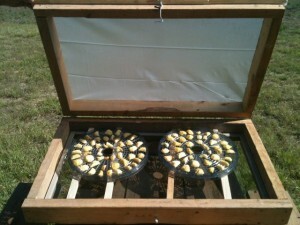 RancherMan built a solar dehydrator for me a couple of years ago. He just used inexpensive materials we already had around the house. These apple slices were dehydrated without any energy being paid for. Thank you RancherMan – Genius! Then last year I finally made the leap and purchased a * solar oven so I’ll be able to not only dehydrate things but also actually cook outside using just the energy from the sun. OMGosh y’all, I LOVE my solar oven! So far I’ve cooked Boneless Pork chops, Baked Potatoes, Homemade Marinara Sauce using fresh garden tomatoes, BBQ Pork for sandwiches & even baked our own Fresh Bread! You can see all my Solar Cooking Recipes Here. And of course grilling outside is always a good option for keeping cooking heat out of the house. Go ahead and combine the grilling with the cook-once-eat-twice cooking. Fill that grill surface up with different kinds of foods. After supper just section off meal-sized servings, label and freeze. I often have RancherMan grill up boneless pork chops for the freezer along with the chicken and veggies for tonight’s supper. Hopefully I’ve gotten your mental gears turning. These are all easy ideas to incorporate in almost any household. Let’s learn from each other. What are some of your favorite ways to keep cooking heat out of the house in the heat of summer? And if you’d like to receive an email each time a new blog post goes live it’s EASY to Subscribe to our blog! When you buy something through the affiliate link it’s a great way to support this blog without anything coming out of your pocket. So click often! 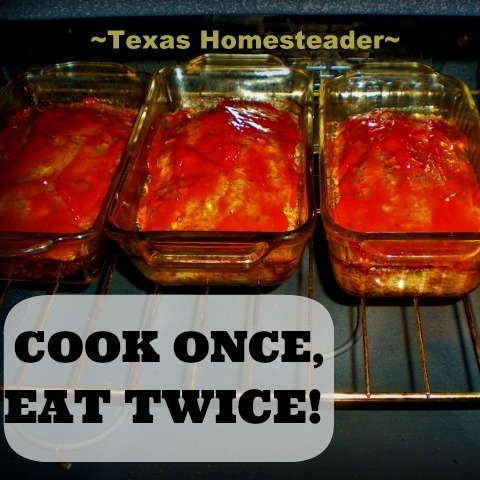 This entry was posted in Blog Posts and tagged Cooking, Environment, Frugality, Solar Cooking, Summer on June 2, 2013 by Texas Homesteader. Excellent article! Thank you so much for joining us at The Homesteaders Hop. How to see you again this week. These are fantastic ideas! I really love your solar dehydrator! Could you post a tutorial on how to make one sometime?? Thanks for sharing these ideas with us on Simply Natural Saturdays! This is my first southern summer and I need all the tips I can get! I’ve chosen this post for my feature this week on Front Porch Friday – once again, thanks for stopping by. I love cooking outside!! Thanks for sharing on My 2 Favorite Things on Thursday – Link Party!! Hope to see you again this week!! Love having you!! Pinned!!! I’m so loving the idea of cooking once and eating twice. The oven is the one thing that really heats up the house really quickly. Great tips and thanks for sharing on Merry Monday. So many great tips for cooking outside! Usually, just using the grill for us during the summer but I’ll keep the rest in mind to try, thanks! The solar oven is very interesting…great ideas to beat the heat! I’ve been crockpotting on the porch for years! I also cook later, I’m a night owl anyways so I cook the next day’s dinner after the kids have gone to bed, once it cools off outside. Prep goes faster, too! Hello from Natural Living Monday. Great ideas! I love making sun tea in the summer. I also cook more and have it for later. Thanks for sharing! Such great ideas for summer cooking. I hate to heat up my kitchen this time of year. Thanks for linking to TTF. I love your ideas … especially the cooking outside options (your dehydrator is fabulous). The great thing about your alternatives to the oven and cooking indoors is that they are Eco-friendly as well as “cool”. Brilliant! I found this post via Wonderful Wednesday Blog Hop! I found your blog from Down To Earth. Thanks for the great summer ideas! I have some tea on the back deck now. I don’t know why I didn’t think of the sun for iced-tea before. We like to use our cast iron dutch oven over charcoal….especially in the underground oven we built with flashing and river rocks. I have also used my steamer and my crockpot in the garage. I am really interested in the solar oven, I will check I out. Great post! Thanks for posting to Green Living Thursdays! at http://www.dudesustainable.com. Love your ideas. We do a lot of the same. We will grill once and eat twice too. I also run the overhead vent when I use the stove in the oven. Helps to draw the heat up and out so it doesn’t heat up my kitchen. We’re going to attempt to build a clay oven sometime this year! It will move the heat outside and we’re hoping to draw folks to the farm with some clay oven pizza and fresh bread. These are all really great ideas. I have a ‘summer kitchen’ on my back porch for this very reason. It’s a bar height table that my husband made out of old decking lumber. I paid my handyman $50 to install outdoor outlets at bar height behind it. I use all the portable kitchen appliances you mentioned plus a lot more. Did you know you can bake bread in a toaster oven and a crockpot? You can cook pasta in a deep fryer – just add water instead of oil. You can steam or boil anything in a deep fryer. I also use an electric skillet to saute or fry food. And of course, my grill is on my back porch for barbecue. It makes a huge difference in the comfort level of my house & it’s very conveniently located right outside my kitchen. Great idea, I know I hate cooking in a hot summer kitchen!!! We’re hosting our 1st SUPER SUNDAY Linky Party, stop on over & link up: http://whoneedsacape.com/2013/06/super-sunday-party-1/ Lori Whoneedsacape.com Not Your Average Super Moms! These are great ideas and I have to say I never even heard of a solar oven. We take the crockpot outside too….in fact, I thought I might be the only strange one who does that. 🙂 I just don’t like to smell something that long. Thanks for the ideas! Great ideas!!! We are cooking outside as much as possible these days! Summer heat can really get oppressive, and these are great ways to alleviate some of it. I’ve done a few of these things, but never thought about the concept of cook once eat twice. good ideas. We mainly just avoid recipes that have to be cooked, especially baked or cooked a long time. Gazpacho (mentioned in a comment above) is a favorite, and marinated tofu over salad, and hummus with vegetables to dip. Cooking a lot on a rainy day and then eating leftovers on hot days works, too. We use a George Foreman Grill to cook veggie burgers and other flat, pre-cooked foods. My brother, a home energy auditor, told me it’s very energy efficient because so little heat escapes. It toasts the buns, too! You don’t get that “standing over a hot stove” feeling while using it, and it doesn’t make the kitchen noticeably warmer than the dining room. I am all about cooking two or three things at once. Last summer when I would heat up the oven to cook bread, I would cook several other items along with it. It would be like Thanksgiving when the oven is filled with stuff. This year I will be making more english muffins. They are cooked stovetop, or in my case on the electric griddle. I am also going to use my dutch ovens more for cooking outside. I am working up plans for a brick oven for our space out back. I would love a solar oven, I think that having skills like this are important. Being able to think and cook outside the box is a wonderful Idea. I live in Arizona and the heat is no joke here too. We just moved into this house about a year ago and one of my major projects i hope to finish soon is an outdoor kitchen of sorts. I love your food dehydrator and a solar oven in on my wish list as well. Something else I do is bake in the early mornings. Great ideas. I need to work on some of these. I can’t wait to hear about your solar oven cooking. Thanks for some awesome tips. I’ve never thought to cook once, eat twice or move my crock pot outside. We have actually sweat our way through four summers without air conditioning and it’s supposed to be installed TOMORROW. I can’t wait! We use a couple of your suggestions here in Connecticut. I grill mo about 6 months out of the year and we make sun tea here as well. I like the idea of the solar cooking too. Thanks for sharing Tammy. Once you start using your solar oven – you will love it! I live in Las Vegas and use it all the time. You can use it to bake or cook so many different things and it doesn’t heat up your home and it costs toning to use – yay! I live in Las Vegas and it’s about 110 here right now. My power bills are threw the roof even though my AC is set at 79. Where did you get the solar oven and how do you use one? These are great ideas! Our house stays relatively cool in the summer (we live in Maine), but there are a few weeks of incredibly hot weather and we typically don’t cook at all at those moments, instead opting for salad and smoothies 🙂 I would love to have a dehydrator. I have heard of people using their cars for such a thing in the summer! Maybe this year I will give it a go as well! I like the grill option when it gets hot. 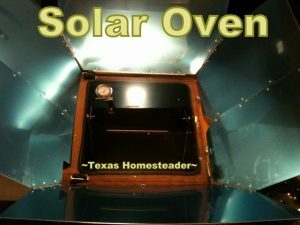 I have been reading a lot about Solar Ovens. It look really interesting!